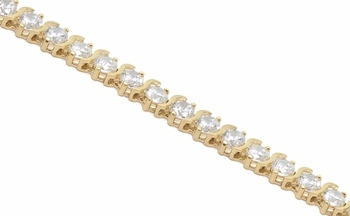 The "S" Link Round Cubic Zirconia Tennis Bracelets are a must-have for every tennis player. This extremely popular style gives you an extra advantage, during competition, on and off the court. Different sized round diamond quality cubic zirconia stones are available for each bracelet size. The small bracelet features an approximate 2.5 carats in total carat weight, the medium bracelet features an approximate 5 carats in total carat weight, and the large features an approximate 9 carats in total carat weight. Available in 14k white gold or 14k yellow gold and your choice of a 7 inch bracelet length or an 8 inch bracelet length. For further assistance, please contact us directly at 1-866-942-6663 or visit us via live chat and speak with a knowledgeable representative.